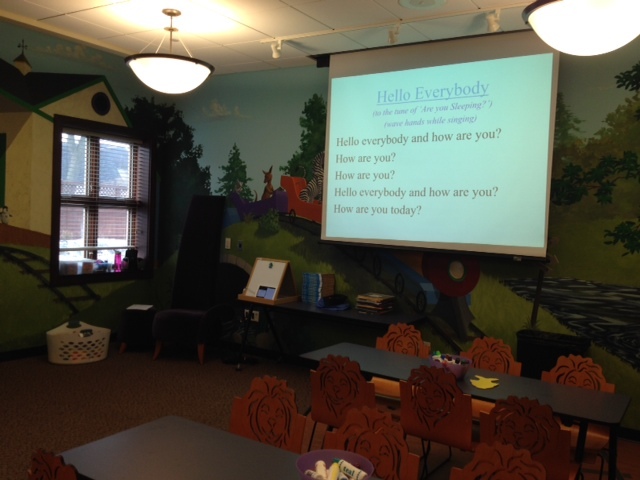 The staff at La Grange Public Library have had several meetings about ways to encourage parent and caregiver participation during our storytimes. Currently, we offer ten storytimes per week for ages ranging from six months to six years. At the start of every storytime session, we go over our expectations for storytimes where we tell the parents and caregivers that we would like them to participate with us. We have also tried handouts, but they were distracting. How could we expect parents to do the actions to the songs and fingerplays when they were holding a piece of paper? Additionally, we tried printing the words to our songs and fingerplays on ledger paper and displaying them on our easel, but little hands often pulled them down and they took up quite a bit of storage space. Last spring, we were fortunate enough to purchase an iPad for staff to use in our department. That’s when I began experimenting with ways to encourage parent and caregiver participation through digitally displaying the words to the songs and fingerplays that I use during my storytimes. Access the presentation offline since the wireless internet in our building can be spotty at times. Have the ability to import my PowerPoint presentations into the app so that I could easily edit my slides based on the material I was presenting in storytime each week. I downloaded the Keynote app after one of my coworkers recommended it. With Keynote you can import your slides via Google Drive. I edit my slides using PowerPoint, then upload my PowerPoint presentation to Google Drive. Both of those are done on the computer. Using the Google Drive app on the iPad, I am given the option of importing my slides into Keynote. Very quick and simple process! It works! I am always seeing parents and caregivers looking on our screen and singing along with me. The biggest improvement has been in my lapsit storytime. The parents’ and caregivers’ hands are free to bounce, tickle, and play with the babies, allowing for full participation. I keep the iPad next to me on the floor and I can easily swipe the screen to move on to the next song. Using Keynote also allows me to stay on track during my storytimes. A big improvement to my post-it notes! Keynote’s ease of use has allowed me to use the iPad in other programs as well. I have used it during my book discussion programs and during our Every Child Ready to Read workshops. We are currently looking into wireless options for using the iPad in the activity room where our storytimes are held since the iPad has to be attached to our wall panel and this setup doesn’t allow me to move freely through the room. I’d also like to use Keynote for storytelling or to display pictures to introduce the children to our storytime topic/theme. I’d also like to include early literacy tips on the slides in such a way that it is beneficial to the parents but doesn’t take away from them being able to sing along with me. Keynote can be purchased for $9.99 through the iTunes store. It is currently available on iOS devices only. The Google Drive app is available for free in the iTunes store. Rachael Dabkey is a Youth Services Associate at La Grange Public Library in La Grange, IL. You can find her on Twitter @rachaeldab, visit her blog at rachaeldabkey.wordpress.com, or send her an email at dabkeyr@lagrangelibrary.org. Posted on April 14, 2014, in Apps, Libraries, Story Time and tagged Rachael Dabkey. Bookmark the permalink. 2 Comments. My guest blog post for Little eLit! Rachel I too am trying to use our library’s iPad in storytime. I will have to try the Keynote idea.